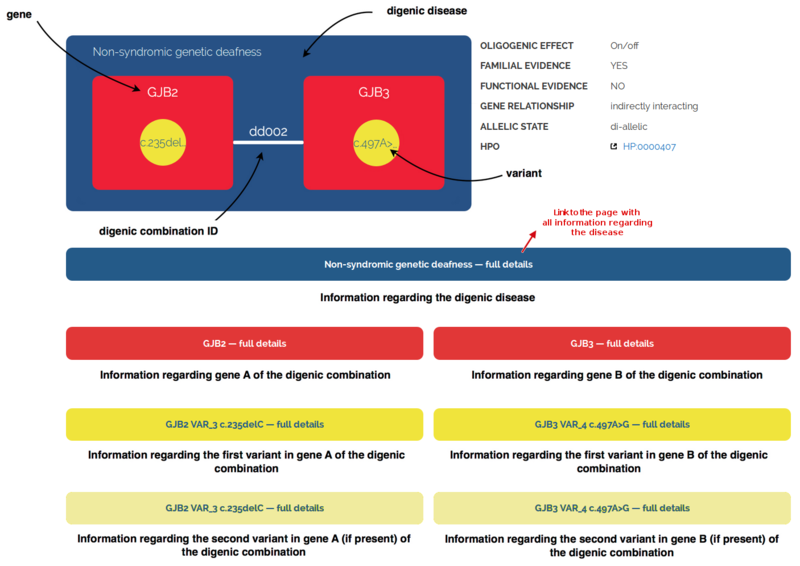 DIDA is a novel database that provides for the first time detailed information on genes and associated genetic variants involved in digenic diseases, the simplest form of oligogenic inheritance. On this page you will learn more about how to use DIDA and its website. DIDA is a novel database of known digenic combinations involved in different human digenic diseases. It represents a first systematic effort in collecting information related to these diseases in a single repository. More information about digenic inheritance and the rationale behind DIDA can be found on the HOME page. Figure 1 represents the conceptual framework of DIDA. The basis of DIDA is a digenic combination, found in a patient that is affected with a digenic disease. 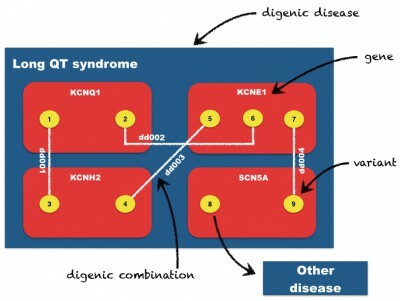 Each digenic combiantion has a unique ID (“dd000”) and is composed of two, three or four variants present in two genes, that are both linked to a digenic disease. Figure 1: Conceptual framework of DIDA. All information present in DIDA can be accessed through the BROWSE page. The data is provided to you under the form of four tables: GENES, VARIANTS, DIGENIC COMBINATIONS and DISEASES. These tables can be accessed by clicking on their names (see figure 2). An explanation about the content in each column of the four tables can be found by hovering over the column header or checking the DOCUMENTATION page. 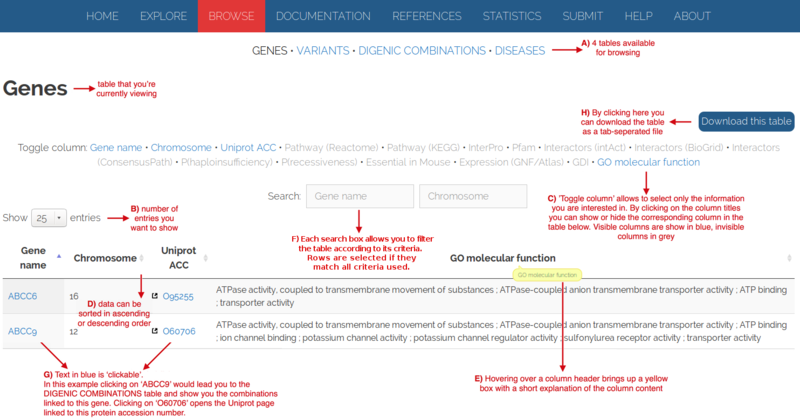 Figure 2: BROWSE page with four tables: GENES, VARIANTS, DIGENIC COMBINATIONS and DISEASES. Figure 3 provides an overview of the functionalities present in the tables that can be accessed through the BROWSE page. Figure 3: Overview of the functionalities present in the tables on the BROWSE page. Clicking on the ID of a digenic combination (“dd000”) opens an overview page with all the information present in DIDA regarding the combination-of-interest (figure 4). An overview of how this page looks is present in figure 5. Figure 4: Digenic combinations table with link to specific digenic combination page. Figure 5: structure of the specific page for each digenic combination. A link to the original publication in which the digenic combinations are described can be found on the REFERENCES page. Figure 6 provides an overview of the functionalities present on this page. Figure 6: overview of the functionalities present in the REFERENCES table. 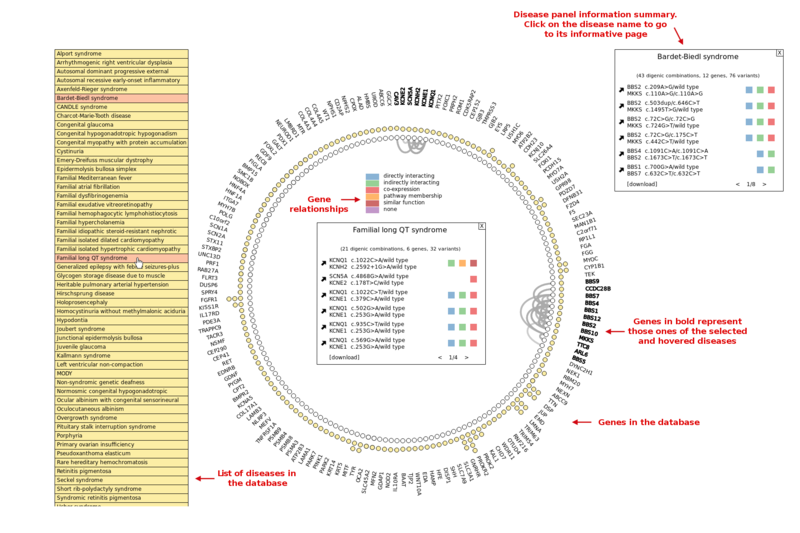 Figure 7 represents a circular visualization of all the data contained in DIDA. Each gene forming the circle is represented by a white dot, and a yellow dot represents a digenic disease in which the gene is involved (multiple yellow dots means that the gene is related to different digenic diseases). On the left of the circle, there is a yellow panel for selecting the disease/s of interest. After the selection of a disease of interest the genes in the circle linked to that disease become bold, and edges between genes appear: each edge represent one or more digenic combinations mapped on that pair of genes. Additionally, a disease panel summary shows an overview of all the digenic combinations involved in that disease. A color panel shows the type of relationship between the two genes involved. Figure 7: Circular visualization of DIDA. Figure 8 After the selection of a disease of interest, one can observe the cluster of genes involved (bold names). An edge between two genes is present when at least one digenic combinations mapped on these genes is present in DIDA. The color of the edge is related to the number of digenic combinations mapped on that pair of genes: the darker the edge the higher the number of digenic combinations. Moving the mouse over a gene node (white dot) highlights in green the interacting genes. Figure 8: Genes and edges. Figure 9 Moving the mouse on a disease of interest (the yellow panel on the left of the circle), an overview of the digenic combinations leading to that disease is shown inside the circle. By clicking on a disease one can fix the disease panel on the right of the circle. Multiple diseases can be selected, in this way one can compare two or more digenic diseases. 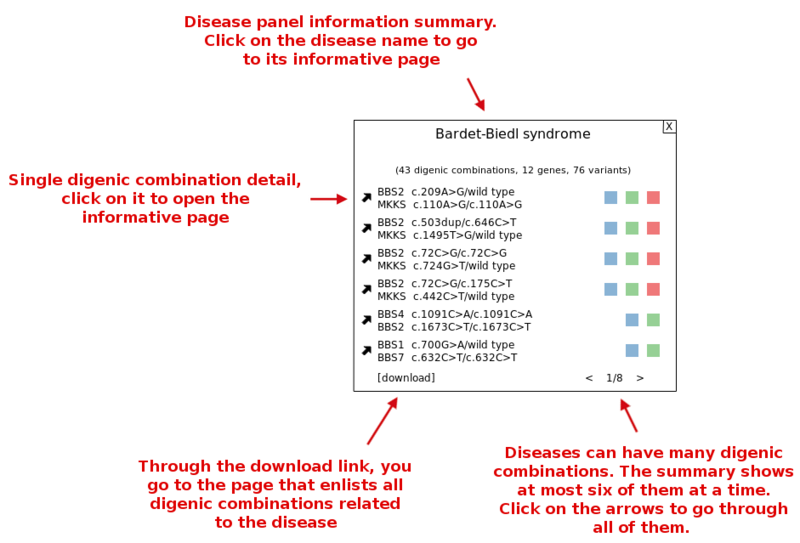 The disease panel contains a summary of the causative digenic combinations, by clicking on a specific digenic combination the user access directly to the detailed digenic combination page (FIGURE 4). By clicking on “download” the user accesses to the browse page and visualize/download annotations about the digenic combinations selected. Besides browsing through the existing data, we also allow users to send their information to expand the database. New submissions will only be accepted after careful manual inspection. Information on how and what to submit can be found on the SUBMIT page. STATISTICS. Some general statistics about the data present in DIDA are gathered on the STATISTICS page. Each graphical representation of the data is accompanied by a short explanation of what is shown.